Research Institute of Forensic Expertise"
National Bank of Ukraine puts into circulation since July 3, 2013 the commemorative coin “100 Years of Kyiv Scientific Research Institute of Forensic Expertise “ par 5 hryvnia dedicated to one of the oldest state expert institutions of Ukraine, which began operations in 1913 as the Cabinet of scientific and forensic expertise at the Prosecutor of the Kyiv Court Chamber. After a difficult path, the Institute has become one of the leading institutions of forensic support, where highly skilled forensic experts work. The coin is minted using modern technologies of bimetallic coins: the outer circle - copper-nickel alloy, internal circle - Nordic (CuAl5Zn5Sn1), quality coinage category - "special uncirculated", in diameter - 28.0 mm, weight - 9.4 grams, circulation - 15,000 pieces. Coin group - sectoral corrugation. Obverse: at the top there is the small State Emblem of Ukraine and circular inscriptions: NATIONAL BANK OF UKRAINE (above), five hryvnia (below) to the right - the year of issue – 2013, to the left- the Mint logo of the National Bank of Ukraine, in the center – Institute logo. On the reverse there is the building of the institute with the inscription below - 100 / years and the circular inscription Kyiv Scientific Research Institute of Forensic Expertise. Artists: Volodymyr Taran, Oleksandr Kharuk and Sergiy Kharuk. Sculptors: Volodymyr Demyanenko, Anatoliy Demyanenko. 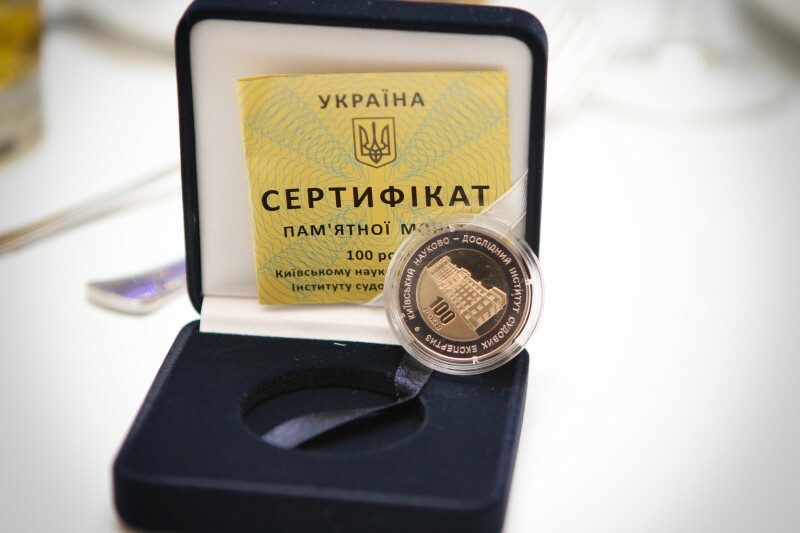 The commemorative coin is a valid means of payment in Ukraine and mandatory for acceptance without any limitation on its face value to all types of payments and for crediting accounts, deposits, letters of credit and transfers.